Elastic fabric jacket, without collar, with alongside collar. 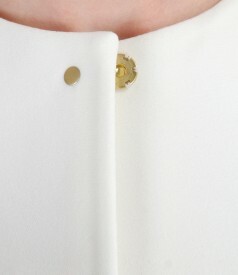 Two hidden side pockets and sleeves with slit closed with metalic zipper. Closes with 5 hooks, marked on front with applied metalic targets, until the base of the neck.